The Ward Family: My Old College Roomie Denise Meets Brody! 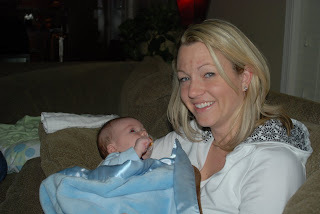 My dear friend and old college roomie Denise made the trek from Omaha NE to Minneapolis this past weekend to meet Brody! She arrived Friday evening and we did it up Nebraska style with grilling up some Omaha Steak branded hot dogs and burgers (I know, where's the steak!?!). Then on Saturday we took it easy, so easy that we wore our PJ's all day long and just hung out. The beauty of old friends...you can do nothing and still have a nice time! Well there is one thing that we did on Saturday that was top secret...we went to Dairy Queen (umm yea, sorry J, we went to DQ w/out you, perhaps it was feelings of guilt!!). It was the perfect day for a cold treat as the weather was beautiful! Denise took off on Sunday...thanks again for coming to visit us! !